As many of you may know, this is my last weekend in the UAE until my 30 day vacay to South Africa. Not ready to leave just yet as a desert safari has been on my to-do list since my very first visit to Dubai. 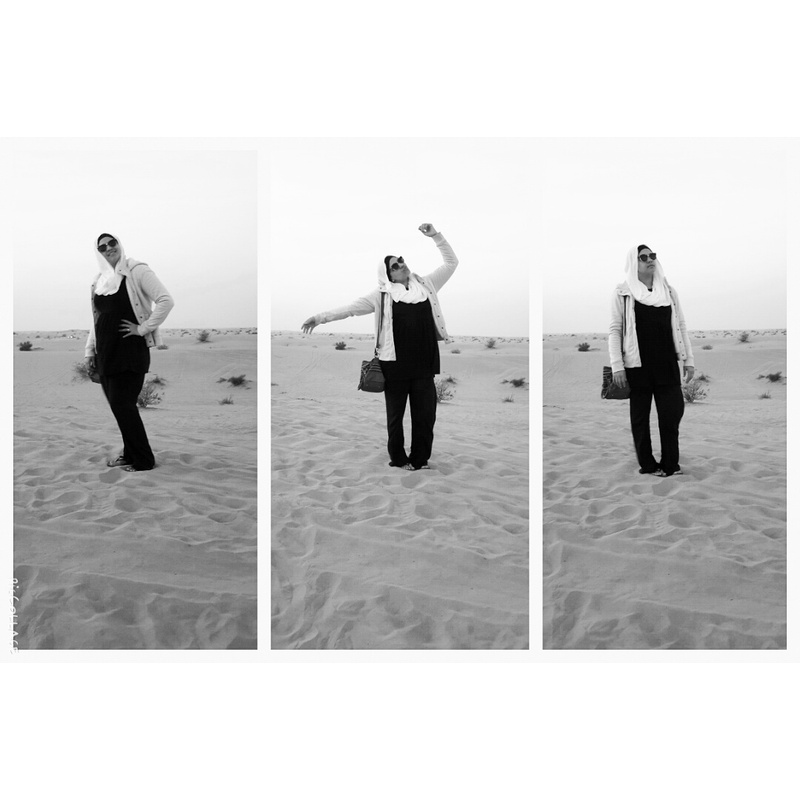 I finally got the chance to explore and experience the marvellous desert everyone raves about. To be honest it wasn’t exactly what I thought it would be but the day ended up just fine. I might have been a little too excited to book a tour and failed to do proper research. We ended up with what seemed to be a pretty disorganised company. But like I said, it was well worth the experience. Not knowing what to expect, we waited at the pick up point with a few other people. After a really long drive through the streets of Dubai, we finally arrived at the camp site where we were off loaded and then reloaded into another vehicle, a 4×4, with a driver who has a serious need for speed. This was where the fun started though. I did not know what to expect. We all clinged to our seats as the driver sped off into the desert sand dunes. I was kept at the edge of my seat the whole time as we endured a thrilling adrenaline pumping rollercoaster ride, up and down the humongous sand dunes. I was screaming so much I could hardly breathe. Each climb and fall was even more exhilarating and nerve wrecking every time, not to mention being thrown around like a rag doll. I was so happy when the dune bashing ended, this is definitely not for the faint hearted. We were later dropped off at the main Bedouin like camp site where we were left to fend for ourselves. Not knowing what to do I suggested a camel ride but then it took convincing because I suddenly felt afraid of the cuddly creatures. If you ever mounted a camel before you would know it gets up with both of its back legs first, throwing you forward while you holding on for dear life, until the front legs catch up and then with a very jerky like movement your ride begins. I was nervous throughout it all, I was so happy when it was over. None-the-less, I had my first camel ride while watching the amazing desert sunset. It was definitely not as beautiful as an African one but well worth it. Not wanting to be any more adventurous and daring as I’ve been so far, I skipped posing with a falcon and headed straight for the henna cubicle inside the village. I received a cute complimentary Arabic Henna design done on my hand. I’m always so fascinated by the ladies who do these designs. It takes a lot of time, patience and creativity to piece together. Once the sun had completely set the night time festivities began with a Tanura show. This is basically a guy spinning around and around. I felt dizzy throughout the performance, and even though I’ve seen this dance done before, I still found it entertaining and unique. I would not last a minute trying, so I remained seated while a few of the tourists went on stage and had a go. We enjoyed a lovely dinner under the starry arabian sky before the last act came on stage. Me, obsessed with belly dancing, was the first to welcome the dancer on stage. Belly dancing has always been my most favourite form of dance. So, as she shimmied, shivered and shook, I cheered her on! I was well disappointed when the show was over, but then all good things come to an end. Heading home was as entertaining as the whole trip experience as well, somehow we left a few people in the middle of the desert, accidently. Hopefully, things will be a little more organised in the future. I hope they were found. Anyway, we got home safely with yet another incredible day tucked safely away in our memories forever. A desert safari is a must do if you ever find yourself in the UAE. I will however suggest that you find the best tour company and not settle for something less expensive because you get what you pay for. This is not the last the beautiful desert will see me, I’m definitely going to do this safari again. It makes me so happy to read about you trying new things.